16 Days of Activism Against Gender Violence is an international campaign that originated from the first Women’s Global Leadership Institute in 1991. This 16-day period highlights significant dates in order to symbolically link violence against women and human rights and to emphasize that such violence is a violation of human rights. Some of these dates include: November 25 – International Day Against Violence Against Women; November 29 – International Women Human Rights Defenders Day; December 1 – World AIDS Day; December 6 – which marks the Anniversary of the Montreal Massacre; and, December 10 – International Human Rights Day. A Fundraising event being hosted on Monday, November 21, 2016 at locally owned and operated restaurant -Table 10. 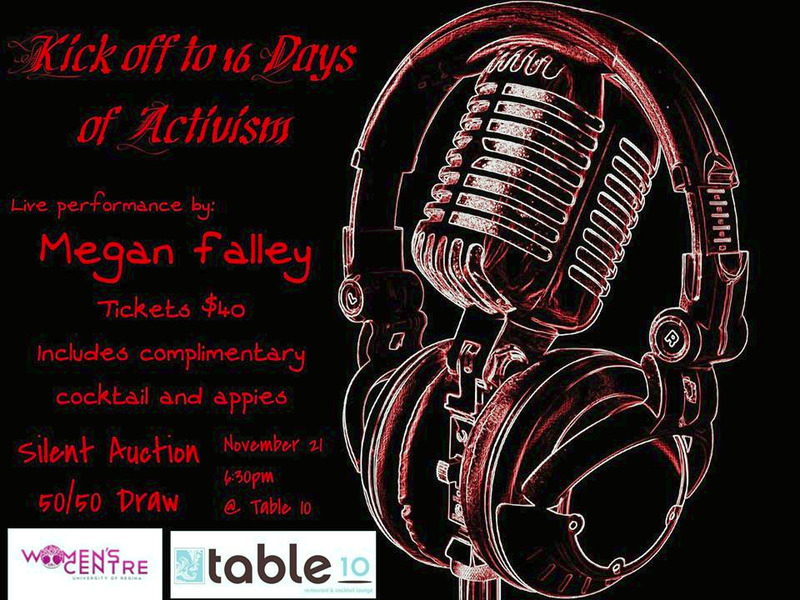 This years 16 Days of Activism will kick off with a live performance by Megan Falley, along with silent auction. All proceeds raised from this event will be used to create Survivor Kits or care packages to be given to survivors of sexual assault at the General Hospital. See you at Table 10 on November 21!